We recently celebrated another birthday for Brent and decided to bring the Melting Pot experience home. 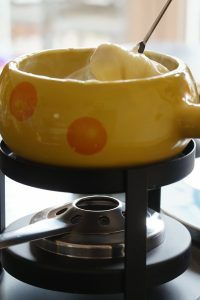 We found a “copy cat” recipe for their cheese fondue. What a tasty adventure this was! This is a savory cheese fondue made with beer not wine. Not as pungent flavor as many that I have had -- much more pleasant for the whole family. Shred or cut the cheese in small pieces. Toss it with the flour to coat. Heat a double boiler on a medium heat burner and add the flour-coated cheese. Let it soften a bit then add the beer mixture. We kept the cheese in our double boiler pan at the table. We found that the boiling water from the bottom pan kept it warm enough for the 4 of us to eat and enjoy. We had more boiling water ready if it needed a heat up. It's also possible to use a small crock pot (ours was full of the chocolate fondue we were having for dessert) or a fondue pot (but remember to buy the sterno heat - which I didn't). The four of us dipped french bread, soft pretzels, broccoli (cooked al dente) and meatballs (warmed thoroughly) and enjoyed the flavors enormously.